I can just picture your reactions now: “Oh my…is she…is that a REVIEW? !” Yes, yes, I know it’s been quite some time. It’s not that I’ve stopped reading! It’s just that I’ve recently been reading a lot of nonfiction rather than YA. I’m finding my history addiction is growing rather than shrinking. But I did manage to squeeze a YA historical fiction in there for you. This is the story of Alfie and his father, a soldier in the Great War. When war breaks out on his fifth birthday, Alfie knows things are changing, but he doesn’t expect his father to be gone for 4 years on the Continent. 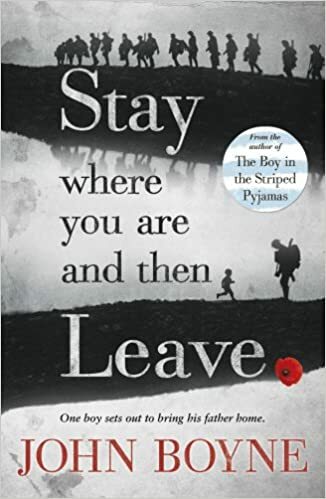 And when Alfie learns that his father isn’t on the Continent but in a hospital in England being treated for shell shock, he’s determined to help him as best he can. But the lies are thick in England and Alfie will need to learn the truth if he’s going to succeed. I wasn’t sure what to expect from this book for a couple of reasons. First, this author wrote The Boy in the Striped Pajamas, which I couldn’t seem to like. (And not because of the ending, but because I thought Bruno was an idiot, even for a young boy.) And secondly, I don’t happen to find many WWI fiction books, so I don’t actually know how they’re going to go. But I thought this was an insightful look at the early days of shell shock, or PTSD as we now know it. People had no idea what it was and it wasn’t viewed as a real illness, even though hundreds and thousands of young men came home seriously messed up. And we get to see that through Alfie’s eyes as he struggles with understanding what’s happened to his father. I liked that this focused on WWI, which isn’t as well known as WWII. No one had ever seen a war of that magnitude before and they had no real idea of what it would be like or how long it would last. And this all comes out through the story. I found I did like Alfie, especially since even at 9 years old he wasn’t an idiot. He didn’t always make the smartest choices, but he did what he thought was best. And he actually is pretty clever. The plot was a little slow at times, but I also read it over the span of almost a week, so that might have been part of it too. I couldn’t (and didn’t exactly want to) read it all in one sitting. But that was ok. Overall, I found this to be an interesting read. It was a bit unexpected but entertaining. Ooo, I’m so curious about said nonfiction books! I’d love to hear about which ones you’ve been picking up, etc.- I’ve been trying to get more into nonfiction myself and to be honest, I just have no idea where to start. An interesting topic would definitely be helpful. 😉 Great review; glad you enjoyed this one!